Set Up: 24 x 24 Four grids of 12 x 12. 11 players required for this set up, you can add to defending team and attacking team should you have more players. Instructions: Game starts with a pass from the coach, once the pass enteres the grid the team in possession must look to support and play 4 v 2 in the area trying to combine 5 consecutive passes before switching the ball into another grid. Once ball has been switched the 2 active defenders must spring into shaded area and tag with their teammates who then enter into the gird in play. 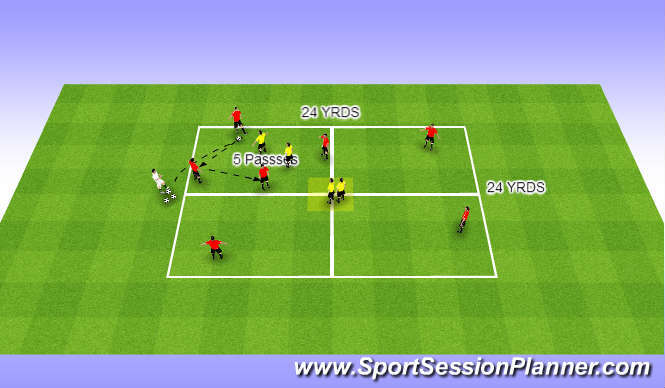 Coaching Points: This exercise focuses on developing cooperation of players while in possession and helps develop speed of play. Developes game focus on reaction ability,awareness, and helps innervate the importance of the early supporting movements of the players.